HomeInvestigation of MDEQ’s new “Corrosion Control” claim reveals more deception and incompetence: Where is the EPA? Let’s examine the veracity of the latest MDEQ claim about “lime corrosion control” using our own data and that from the City of Flint. We agree with EPA that “one common corrosion control treatment strategy is to raise the pH of the source water.” And adding lime is certainly one way to raise pH. However, lime is added at Flint for softening (i.e, reducing the hardness of the water), and afterwards, the water pH is reduced with acid. The net effect of the lime/acid treatment process used at Flint, is to increase corrosivity as measured by pH (Figure 1). Specifically, when we sampled in Flint in mid-August, the Flint River (source water) pH was 8.4, and after the lime/acid addition the pH was decreased down to 7.3. Figure 1. The net effect of lime/acid treatment in Flint for softening, is to decrease pH and increase corrosivity of Flint Treated Water. As we only collected one data point, we then looked at the City of Flint’s data submitted monthly to the MDEQ which is available online. Not only does it prove that their lime/acid treatment is making the water more corrosive by lowering the pH of the Flint River source water (Figure 2), but since the lead problem first became public in early 2015 the treated water pH has been steadily DECREASING and corrosivity has been INCREASING. Incredibly, even as MDEQ issued false public assurances and worked to cover up problems with high lead in water, the average pH of the treated water was dropping from above pH 8.0 to below pH 7.4. The minimum pHs are even more worrisome, but the point is obvious based on the reported average. Such low pHs are unconscionable in an aging system full of lead pipes when a corrosion inhibitor is not present. 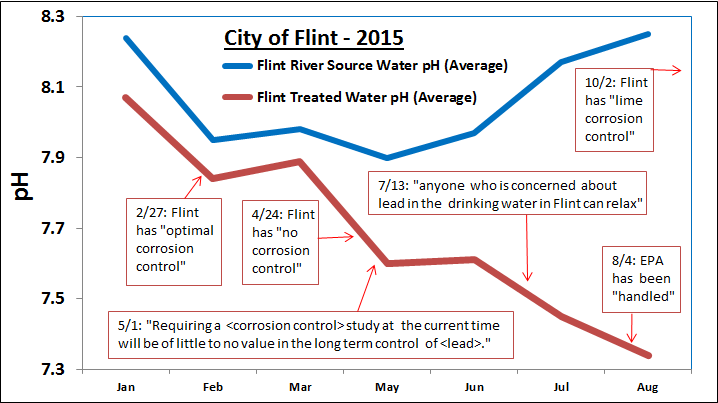 Did MDEQ ever even look at Flint’s pH data, which demonstrates the alarming increase in corrosivity? Figure 2. 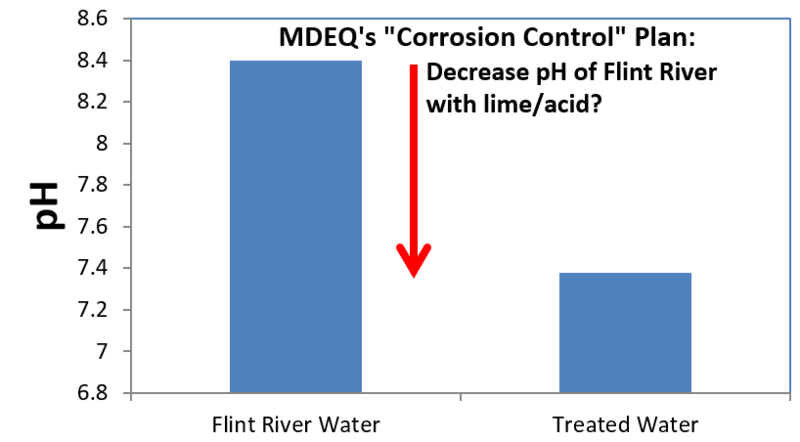 Data submitted by City of Flint to MDEQ, that illustrates the net effect of lime/CO2 treatment to reduce the pH, to increase the corrosivity of Flint River water. MDEQ quotes about the corrosion control situation in Flint indicated by arrows. At this point, nothing MDEQ says should be believed. First, Flint residents had to determine on their own that MDEQ’s written assertion of “optimal corrosion control” was false, after children’s blood lead was elevated from drinking the water. When confronted, MDEQ then acknowledged that Flint had “no corrosion control.” If MDEQ’s more recent spin were actually true, and the lime/acid process was part of a “corrosion control” plan, an even more disturbing question arises: Why would MDEQ purposefully increase the corrosivity of the Flint source water? That’s right. Since Flint would be getting a new water “just over one year from now,” MDEQ felt that controlling lead corrosion would be “of little to no value in the long term control of <lead>…” According to MDEQ, the time period from April 2014 to April 2016, was a reasonable short-term lead exposure for Flint’s children. And there is nothing, yet, in the written record, to indicate that MDEQ ever would have implemented corrosion control, if it had not been for intense outside pressure brought by Flint residents, ACLU-Michigan and FLINTWATERSTUDY in late July and early August 2015. Since most Flint residents wrote off MDEQ as unscientific and untrustworthy long ago, sadly, the above revelations really only raise one new troubling question: Where is the EPA? Does EPA’s silence imply consent? Did the EPA, in fact, work out a deal with MDEQ to “handle” their “rogue” EPA employee, Miguel Del Toral, whose interim report first brought Flint’s lead corrosion control problems to public attention? Did EPA give MDEQ’s Communications Director Brad Wurfel, good reason to “promise” NPR reporters that Del Toral’s “final report—not yet released—would tell a much different story” about the legality of MDEQ’s inaction? To date, MDEQ has had their way with the health of Flint’s children and the truth—EPA’s silence is now deafening. I have some comments about trusting the Michigan Department of Environmental Quality. On December 10, 2014 the City of Flint had us test our water. The result was that our water tested at .037 mg/Liter. The EPA has designated .015 or less mg/Liter as safe. Neither the city or the MDEQ notified us that our water was dangerously high in lead content. We did not hear about the results of this test until one month ago when we received a telephone call from Marc Edwards. The EPA has definite guidelines for reporting lead content to residents regardless of results. Residents must be notified within 30 days. Obviously, the city and state are in violation of that EPA ruling. I understand children and the elderly are at risk of lead poisoning. I am 71 and my wife is 68. I do not think of myself as elderly but I imagine I am close to that category. Bottom line: To this date, the government authorities have not notified us of the results of our water testing. The state and city violated EPA guidelines. There has been no EPA enforcement. This is a problem that exists at every level of government. Who will take responsibility for addressing this violation of the law? I was a certified Florida drinking water treatment plant operator for about 10 years. Adding Lime (calcium carbonate) raises pH and can reduce hardness of the water. Adding acid lowers pH. Why can’t the operators at Flint’s water plant just dial back the acid until the pH is where it should be for corrosion control or eliminate it entirely? What am I missing? Does the city/water plant have a contract to buy acid they can’t get out of?